Staring across the grassy fields, I can imagine the goings on of early generations of settler. I’ve studied for years and feel in tune with their changing community and of the people who once lived near what is now the Edmond Davis cemetery. And realizing this was my ancestors’ final resting place, I know the story is not complete; there‘s more to be found and more story to be told. Take a look at Edmond Davis cemetery … zoom in, zoom out and see the fields I see. The southeast corner of the cemetery is the place where my Thomas family is at rest. Edmond Davis and others are at rest under great cedars in the northern portion of the graveyard. And see the white spot midpoint of the west-most fence line? That’s the resting place of Lorenzo Merriman Little, a member of Jesse James’ Gang who was on hand 13 Feb 1866 in Liberty Missouri for the first daylight bank robbery in the United States. 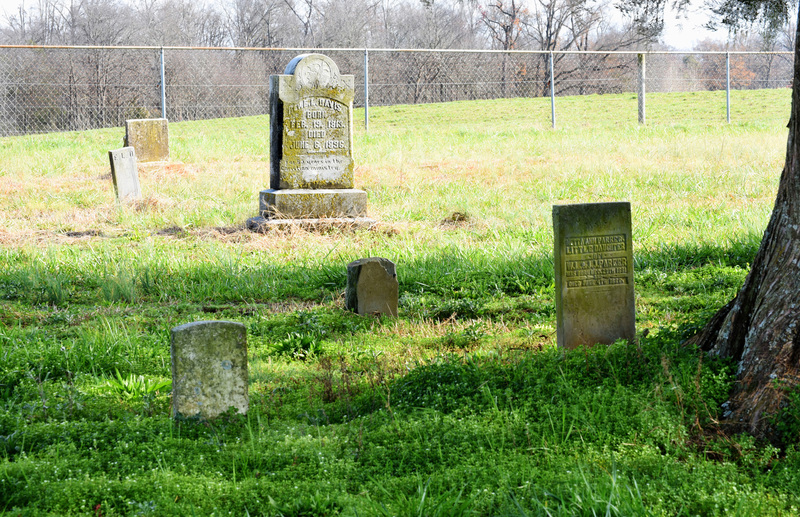 More on Edmond Davis cemetery can be found on Julie A. Hampton’ site. While putting together the title history for lands around the cemetery, I happened across the following deed (left) dated 1821 in which James Baucom conveys 100 acres along Gourdvine Creek to William Holly. 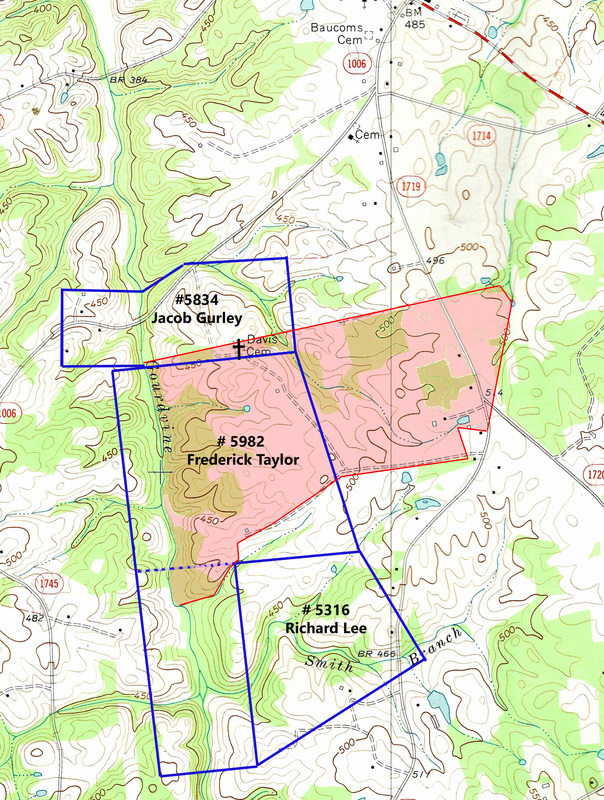 The tract originated as part of a land grant entered 1797 and issued 1811 to Frederick Taylor. Though my next post will delve deeper into the title history of the surrounding area, this one deed opens the possibility that Edmond Davis cemetery was more than a family graveyard. As highlighted in yellow, there must have been a “Meeting House Ford” on the waters of Gourdvine and I can only imagine there was also a meeting house nearby. This is new and big as it does not relate to any known church histories. Well over 10 years before the founding of Jerusalem Baptist and more than 30 years before the founding of Olive Branch Baptist, we now know another church existed in 1821. It’s not Rocky River Baptist as it’s too far away. Let’s look back at the grant, neighboring lands and later conveyances to see where this all fits in today’s landscape. Grant # 5982 to Frederick Taylor, Anson NC, ent. 20 Dec 1797, iss. 18 Dec 1811. 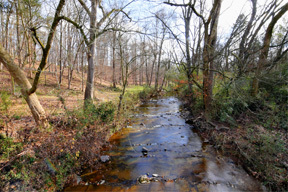 Being 300 acres on both sides of Gourdvine Creek. Deed O-187 Anson NC, 6 Aug 1808, John Jennings Sheriff to Richard Williams for debt owed to Solomon Steagall being the entire 300 acres. Deed S-274 Anson NC, 26 Jan 1818, Richard Williams to Willis Williams being all of the tract lying west of Gourdvine Creek containing 200 acres. Wit: Isaac Williams, Jacob Little. T-304 Anson NC, 26 Nov 1819, Isaac Williams to Obediah Curlee being all of the tract on lying on the east side of Gourdvine containing 100 acres. Wit: Isaac Williams, Jacob Little. T-313 Anson NC, 2 Jan 1821, Obediah Curlee to James Baucom being all of the northern half of the tract above the dashed line containing 216 acres. Wit: Lewis Baucom, Ransom Baucom. L-195 Anson NC, 4 Mar 1805, Jacob Gurley to Isaac Williams Senr, being the 100 acres granted to Jacob Gurley. Wit: Willis Gurley, Isaac Williams. 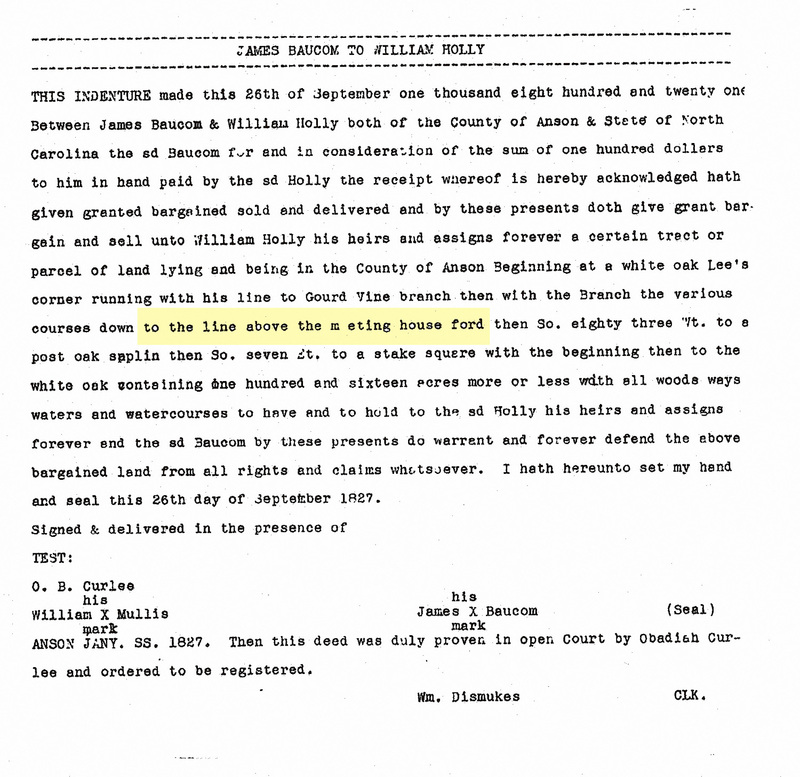 V-92 Anson NC, 3 Apr 1822, James Baucom to Solomon Mullis, being 25 acres of Jacob Gurley’s 100 acres lying on the west side of Gourdvine. The deed states the land was conveyed from said Gurley to Isaac Williams Senr, then to Obediah Curlee and then to James Baucom. Wit: Obed. Curlee. Where was the Meeting House ford located? There’s very little option other than it crossing at the same location as today’s bridge or at least very close nearby. And knowing the location of Meeting House ford in 1821, exactly where was the Meeting House? It’s my belief that at some point from 1800-1820, a Baptist church was organized and built on the hills above Gourdvine creek. 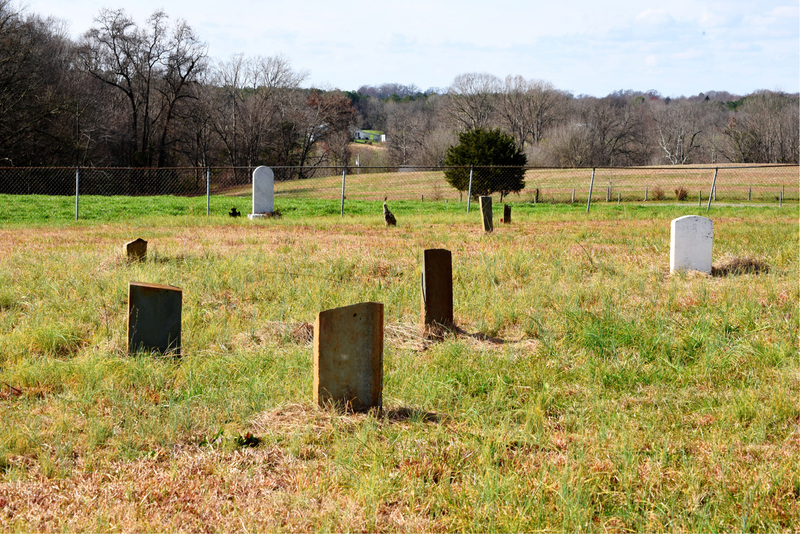 In 1821, at the time James Baucom purchased land from Obediah Curlee, the church and graveyard (now Edmond Davis cemetery) must have already begun to serve numerous families in the community. As Baptists are social in order, survival of the church was dependent upon the clout and leadership of a few families. Something happened to this dynamic causing change. What could have happened? We’ll never know for sure though the 1830’s and 40’s were hard. Migrations west carried away many and there was also disease and death. It’s important that my own David Thomas’ lands at least adjoined the cemetery and that he and his wife both died in the early 1850’s. Baptist minister and uncle Edmond Davis oversaw both the estate and orphaned children. In 1857, he bought David Thomas’s land that adjoined the cemetery. And then in 1858, Edmond Davis and others provided notification that Olive Branch Baptist church was to be built on Henry Baucom’s nearby lands. See Julie A Hampton’s site. The church grew strong and Olive Branch as a community was formally incorporated in 1875. 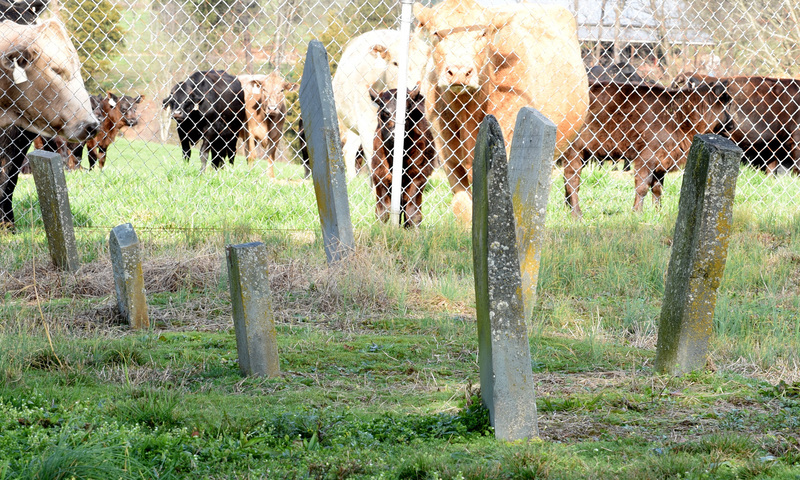 Though Olive Branch Baptist church had its own cemetery, the old graveyard by Gourdvine creek continues its service through today. Why has it survived and why did they name the new church Olive Branch? A sign, a branch of peace, there must have been a very real reason. It’s my belief the name was a way of bringing together a community that had been divided by death, migration or social conflict. It’s only a guess; it’s not meant for us to know for sure. foreground – grave of Ananias Thomas, background by fence -grave of Merriman Little, distant low land – location of bridge and likely site of Meeting House ford. 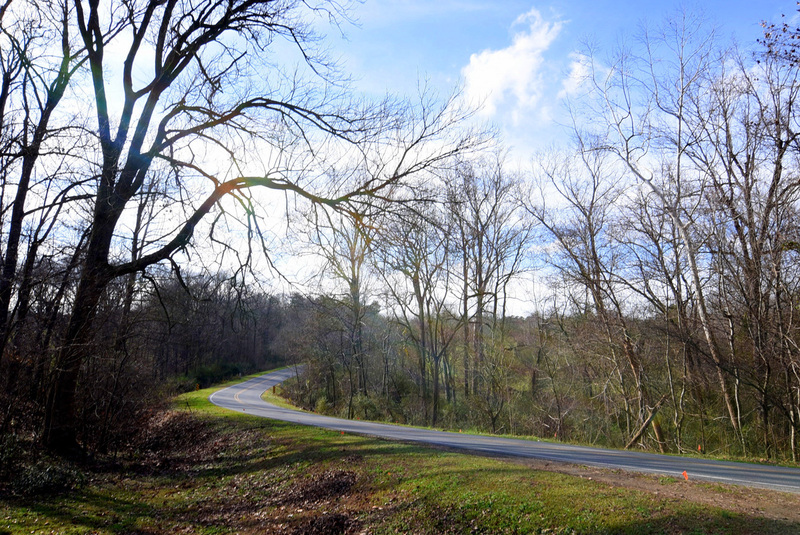 This entry was posted in Benjamin Thomas of Anson NC, Thomas, Uncategorized and tagged Early Baptist churches, Gourdvine Creek, Olive Branch NC, Thomas Family History on December 15, 2015 by geothos. Is this the extinct Gourdvine Baptist Church that members left to start Meadow Branch Baptist Church near Wingate, NC? See “History of the Brown Creek Union Baptist Association” and “Saturday before the Second Sabith”. Both indicate that the Gourdvine Church was in existence by 1815, probably by 1800. Wow…had not put the two together but it sure does appear to be so.